The Newman connection to Brent Knoll in north Somerset is quite recent, beginning in 1954 when I started at Hill Brow primary school at the eastern side of the village - now known by its old name of "Somerset Court" (photo right), the place where the infamous Judge Jeffreys held court after the Monmouth Rebellion, an d from where those found guilty were dragged up the road to what is now the Fox and Goose Inn at the crossing of the A38, where they were hanged and probably quartered - a gruesome history which fascinated all of us schoolboys! The school is now used by the National Autistic Society. Brent Knoll is named after the hill around which the village is built. The Knoll is like a sister-hill to the more famous Glastonbury Tor a few miles inland, since both protrude above the dead-flat Somerset Plains that were once marshy and barely penetrable peat bogs stretching from the Mendip Hills on the north side to the Polden Hills to the south. Legends abound that Christ visited these parts in the years before he began his ministerings in Palestine, whence village names such as Godney are derived. There is an even more famous story that Joseph of Aramathea travelled here with the Holy Grail after the crucifixion of Christ, and struck his staff into the ground at Glastonbury from which the famous Glastonbury Thorn bush grew. Many more mystical stories surround the history of Glastonbury, not least legends that this was once associated with King Arthur's Camelot, and even more obscure interpretations of ancient structures such as Burrow Mump on the south side of the Poldens, and its geometric alignment (the St Michael's Ley Line) with other famous prehistoric sites including Lands End, Glastonbury Tor, and Avebury. See http://www.britannia.com/history/glaston1.html for a good background on the history of Glastonbury. Be that as it may, I know of no ancient legends about Brent Knoll though there is evidence of Roman or pre-Roman settlements around the summit of the hill. Later Brent village was incorporated in the estates of the Abbey of Glastonbury. When I first knew it, Brent Knoll was a typical Somerset village like most others around it, distinguished only by the Knoll itself and by its railway station on the old Great Western main line between Bristol and Taunton (the station closed around 1966). Whilst other villages I knew have hardly changed at all in 40 years, the construction of the M5 motorway at the western end of the village (through the grounds of my old school) has had a big impact on Brent Knoll, converting much of it to a "dormitory" for commuters working in Bristol and other nearby centres. Whilst new (and mostly unsightly) houses have appeared in the village, some of the old community atmosphere has been lost, evidenced perhaps by the loss the New Inn, the decline of the Fox and Goose (if it still exists) and the conversion of the Red Cow from a typical country pub to what is now principally a restaurant servicing diners from miles around, instead of the locals from the village. 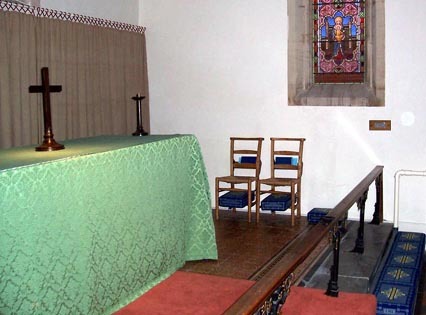 No doubt the church, which used to be the centre of village life (and the dreaded focus of Sunday mornings when I was boarding at primary school), suffers from ever-reducing congregations like most churches in the western world. My other early contact with Brent Knoll was to do with the fact that my best friend Richard Synge lived there when we were at Hill Brow School together. He and I shared a passion for steam trains, fed (no doubt) by the fact that we both lived next to railways - I lived next to the old Somerset and Dorset Branch line, serviced by ancient Midland Railway and old LMS locomotives; he lived within binocular-sighting distance of the old GWR main line. Anyway, we spent much of our childhood together, staying at one another's houses. In 1962, my father retired from his farming activities, and after looking at houses around North Somerset, settled on "Park Farm" in the main street of Brent Knoll (photo right) - a rather run-down farmhouse, that had once been an inn, with still had a huge garden which he thought would satisfy his own passion for gardening. I remember he paid £6000 for it. My parents made the move in the late summer of 1962 (by when I was at boarding school 100 miles away in Berkshire), and spent the rest of the year painting and renovating the house, which we children soon grew to love as much as we had Churchland Farm before it. It is strange that despite the fact that my father lived there for only 5 years (my mother for 3), and despite the fact that I was away at boarding school and university for most of that time, Park Farm feels like "home" to me, perhaps more than anywhere else. My mother died there on Christmas Day 1965, after which (or perhaps it was before) my father decided that the house was too big for him. 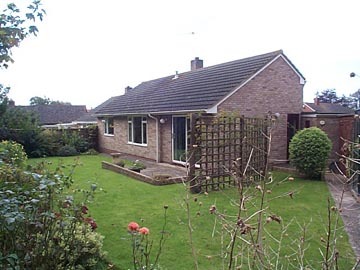 And rather than go through the difficulties of finding another house to live in, he build a new house at the bottom of the Park Farm garden which he named Bilsdean after a house that they had lived in in Southampton in 1933-35. The house (photo left) was designed by a local architect and was completed in 1967, and named Bilsdean, after a house in Southampton that my parents had lived in in the 1930s. [My father had chosen the name for that house in an "unsentimental" manner typical of him, by using a pin-and-blindfold to choose a name at random from a map of Edinburgh's environs (or so he told me). Sad to say, Bilsdean never became "home" to us as Churchland and Park Farms had. I don't think this was because we had grown up by the time it was built, but more to do with the fact that it was new and rather characterless, and certainly not "cosy" like the older houses. Perhaps it had something to do with the lack of feminine touch in its design and furnishings. Anyway neither of us ever liked it much, and we weren't terribly sad to see it sold in 1995 when my father's widow (Patricia) decided that she needed somewhere smaller to live. This she found in the form of "Hillside" (photo right), a small semi-detatched bungalow further "down" the village in Brent Close, at the base of the Knoll. "Hillside" remains under the ownership of my sister Daphne so the family's association with the village has now spanned 50 years (as at 2004) if one includes my school years there. It remains to be seen whether Brent Knoll will be the concluding chapter in the 400 year association between the Newman family and Somerset. 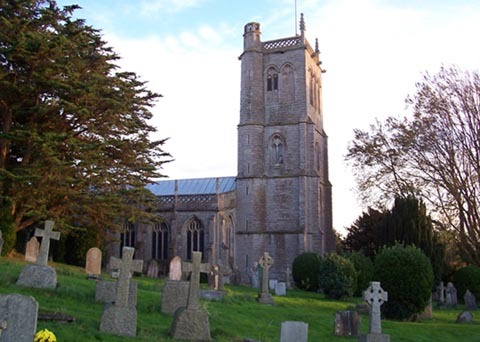 I will include a brief reference to Brent Knoll church, since it has an interesting history, and because the lives and deaths of my father, mother and two step mothers are all recorded in its "Book of Remembrance". Funeral services were held in the church for both my mother and father and for Babs (his second wife). 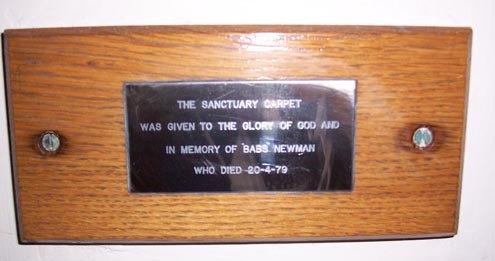 In addition, a memorial plaque (see below) can be found on the south wall adjacent to the altar, installed there by my father to the memory of Babs who had served the church over many years both in the choir and as organist. The church itself is located on the lower south-west slope of Brent Knoll itself. It probably dates from Norman times, though it is thought that Christian worship came to South Brent much earlier, perhaps in the 7th century. The church is famous for its 14th century wooden bench ends which are in the form of a "cartoon strip" that lampoons the then Abbott of Glastonbury (shown as a fox) and his monks (shown as pigs)! Another feature of the church is the memorial mounted into the southern wall of the nave, which is dedicated to John Somerset who once inhabited Somerset Court (mentioned above). The story (such as is known) about John Somerset and Easter Rising in South Brent was recorded by Peter Synge (one-time resident of the village (father of Richard Synge mentioned above) in 1980 which I include as a separate page titled "Easter Rising in South Brent". It is an interesting tale which tells something of the state of the countryside during the 1642-51 Civil War, and is an interesting companion to the notes recorded elsewhere on this site on Sir Ralph Hopton's involvement in the same conflict (Sir Ralph being the person who built Evercreech Park House, later owned by the Newmans).